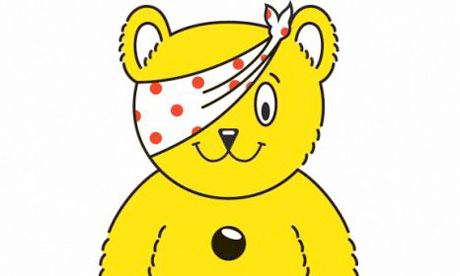 What a wonderful day we had on the South Devon Railway, doing "something different for Pudsey". Almost six months of planning culminated in over 200 members and friends of the railway being involved with the BBC Children in Need fund raising event on 20th November 2009. 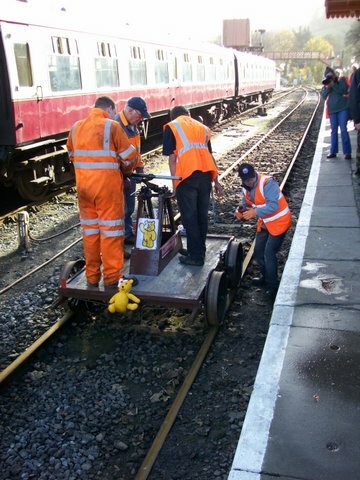 Unless anyone knows otherwise, we were the only event using a GWR Pump Trolley to attack and achieve the 100 mile target, and all done within 10 hours and 46 minutes. This raised the magnificent sum of over £1250 for the Appeal. The BBC had sent their TV Cameraman, Johnny Rutherford, along some nine days previously to film our Trial Runs and these shots were to be extensively used in the run up to the event itself, and were also shown a number of times during the day itself. To back this up, we enjoyed excellent coverage on Radio Devon throughout the day. This involved three "on air" interviews, in addition to their mid programme updates as the day progressed. The culmination was when our gathered crowd cheered the arrival of the final trolley at the platform having covered 100.2 miles, just as presenter Michael Chequer was talking "on air" to Ted Parrott. There were twenty eight members involved in forming the various relay teams to keep the trolley moving towards the target, with minimal stopping time to allow for the introduction of more oil to the axles and cog wheels, and tightening of screws for the hard working handles. The Buckfastleigh Station Group, who had been responsible for the preparation of the Trolley in the month leading up to the occasion, also put on a Barbecue and refreshments for those attending - whether participating or just there to generally support the event. They also had homemade cakes available, and all the donations for this went to the Appeal. Large numbers of onlookers lined the platform during the day, many of them having heard about us on BBC Radio Devon. The Trolley teams reported many car drivers tooting their horns in support as they passed each other at Caddaford curve. The Marathon began promptly at 07.00 hours just as daylight was trying to break through the light rain that was falling at Buckfastleigh Station. Each run was covering the 2.85 miles to Hood Bridge which is generally down hill, and then the same distance up hill on the return. The weather soon improved and the day was mostly bright and sunny but not too hot. This did not stop the team members arriving back at the station feeling very warm and in need of refreshment. Whilst the target time was 40 minutes for each return run, many teams bettered this by quite a margin. The teams were formed of volunteer members in the 18 to 73 age range. The day ended with putting the Trolley away to await the usual excitement for the Thomas event next year, a round of mutual back slapping to everyone who had contributed to the overall success of the day - and another excellent example of South Devon Railway volunteers enjoying a "family" day of responsible fun, and providing media coverage for which no value could be measured. Naturally there is enthusiastic talk of next year, but this will be the subject of discussion in the coming months.